HOK was lead designer for a team that developed the master plan for the Dubai Expo 2020, which is expected to draw more than 25 million visitors to the emirate and wider United Arab Emirates. The design looks to the future while drawing on traditional Emirati community planning concepts. With its mixture of education, innovation and entertainment, the plan reflects the wonderful qualities of Dubai and the form and spirit of a World Expo. The site is on the southwestern edge of Dubai in Jebel Ali, near Dubai’s new Al Maktoum International Airport and Jebel Ali Port, the world’s third-busiest port. The design features three separate pavilions symbolizing opportunity, sustainability and mobility, with “innovation pods” and “best practice areas” in each thematic zone. These three zones emanate from a central plaza named the Al Wasl, the historic Arab name for Dubai meaning “the connection.” Inspired by the layout of a traditional Arabic “souk,” or marketplace, the design places larger pavilions to the perimeter while clustering smaller exhibit spaces toward the center of the site. This creates a smooth pedestrian flow while encouraging interaction among visitors. The team planned the Expo site to create a sustainable benchmark for events in the Middle East. An iconic photovoltaic fabric structure covers the main walkways, acting as a solar-powered sun shade and combining with photovoltaic panels on building facades to capture enough sunlight to generate at least half of the Expo’s energy requirements onsite. Other sustainable strategies include recycling wastewater, reusing materials and monitoring the Expo’s carbon footprint. HOK teamed with Populous and Arup on the master plan. Based on their experience creating the blueprint for Dubai’s successful Expo bid, detailed knowledge of the project and experience with other large international events, an HOK-Arup consortium was selected to design the host venue. The 1,082-acre site includes the dedicated, gated 370-acre Dubai Expo 2020 area and an additional surrounding residential, hospitality and logistics zone. 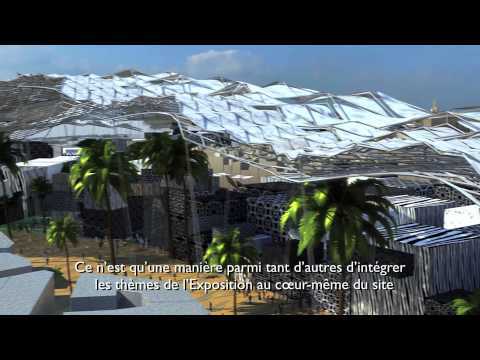 Watch a video of the HOK-led master plan for the 2020 World Expo in Dubai.